The next big thing to be controlled by AI is the humble traffic light - that is if IBM gets its way. The technology company has had its patent granted that sees traffic lights controlled by cameras and not on a timer, as is the case at the moment. Presumably this means there would be better management of the traffic flow, rather than relying on the current metronomic system. The idea would be that a computer would analyze the real-time flow of traffic and then figure out the best way to manage the barrage of vehicles that clog up our highways every single day. "In an approach for adapting traffic signal timing, a computer receives a streaming video for one or more paths of a first intersection," notes the patent. "The computer identifies traffic within the received streaming video. The computer calculates traffic flow for the one or more paths of the first intersection based on the identified traffic." It continues: "The computer determines whether a change in a state of a traffic signal for the first intersection should occur based at least in part on the identified traffic and the determined traffic flow with respect to predefined objectives. "Responsive to determining the change in the state of the traffic signal for the first intersection should occur, the computer calculates a change to a traffic signal timing based on the determined change in the state of the traffic signal. 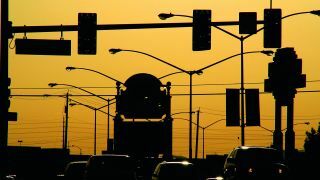 The computer initiates an adaptation to the traffic signal timing based on the determined change to the traffic signal timing." If it works, and there's a ton of people currently stuck in traffic right now wondering what's happened to their lives and if they will ever see there loved ones again that are really hoping it does, then it could go some way in easing congestion. Of course, there are other answers, and Elon Musk is right now preparing the Hyperloop and also his new venture Loop that will just cost $1 to ride an eight-minute trips from downtown LA to the airport, but prizing people from their prized cars is a tough thing to do and that's why we hope IBM's latest patent gets fast-tracked soon.